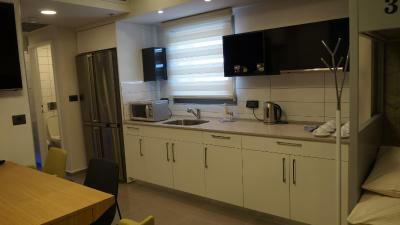 Lock in a great price for Almog Eilat Backpacker's Inn – rated 8.1 by recent guests! The staff is superb! 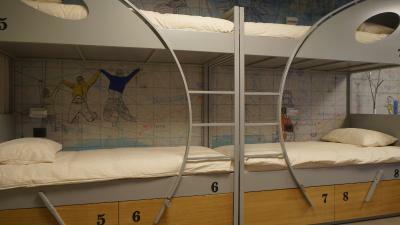 the comfort of the hostel is excellent. It was clean and comfortable. I liked the place very much. This place is weird. I still can’t figure out if it’s a hotel or a residence or a combination of both. Reception for the dorm is difficult to find BUT the room itself is lovely. The AC cranks, there are two toilets, a kitchen, and a 60” TV. Everything is very new and clean. You have access to all the property amenities like the pool, bar, and commissary. If you are heading to the border, the property is very close and the ride should cost about 35 ILS. Overall a great value. Super well equipped room with all facilities included. Modern and clean. Enormous, clean room with fridge, 2 bathrooms, and a huge TV. I was so comfortable. 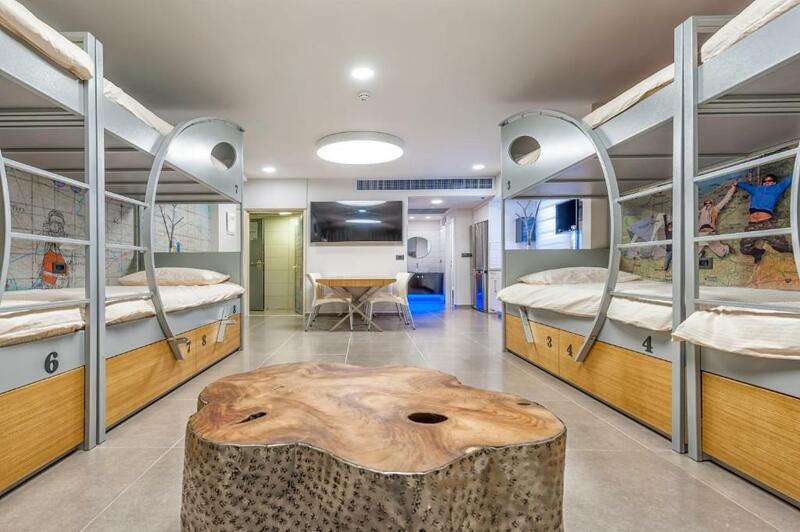 The hostel is located in a large apartment development geared towards young workers in the local hotels and as such has a lot of amenities that are modern and easily accessed. 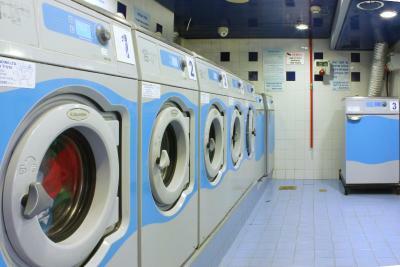 The gym, pool, laundromat, and on site convenience store were all quite handy (though the laundry seems to sometimes not accept cash). The dorm room is quite large and has nice new furnishings as well as two restrooms for when there are more than one or two guests staying. 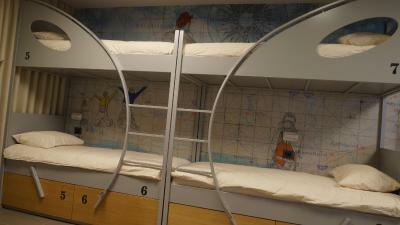 The room felt very secure and, if you like an extra layer of security, safe boxes are available for each bed. The room was new and clean. The shower was very good. One of our best sellers in Eilat! 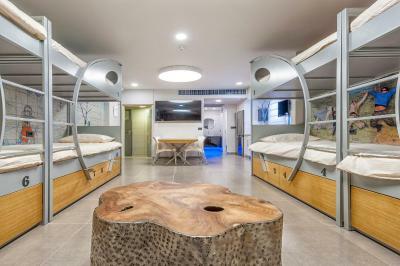 Featuring a seasonal outdoor swimming pool and a fitness center, Almog Eilat Backpacker's Inn is located in Eilat, 6 miles from Underwater Observatory Marine Park. 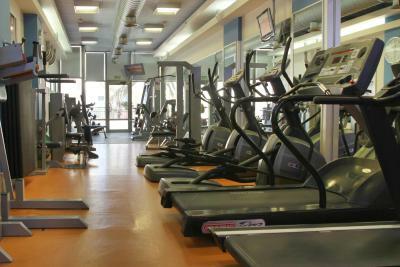 The property is around 2.5 miles from Eilat Promenade, 1.4 miles from Kisuski Beach and 1.7 miles from Moriah Beach. Mediterranean cuisine is served at the restaurant. All rooms at the hostel are equipped with a seating area, a flat-screen TV with satellite channels, a kitchenette, a dining area and a shared bathroom. Guest rooms have a desk. 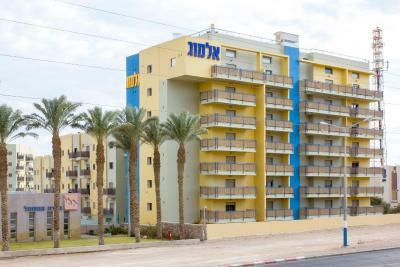 Royal Beach Hotel Beach is 2.4 miles from Almog Eilat Backpacker's Inn. 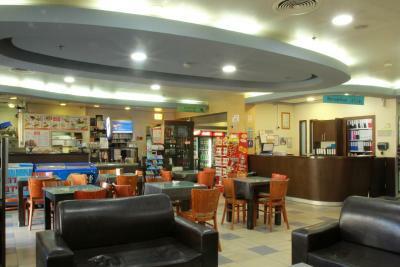 When would you like to stay at Almog Eilat Backpacker's Inn? 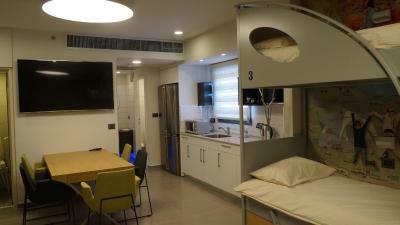 This bed in dormitory features a mini-bar, microwave and kitchenware. 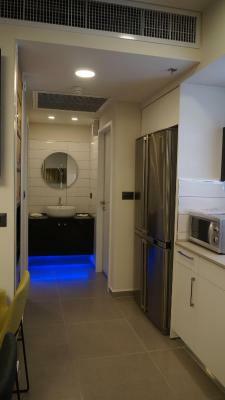 House Rules Almog Eilat Backpacker's Inn takes special requests – add in the next step! Almog Eilat Backpacker&#39;s Inn accepts these cards and reserves the right to temporarily hold an amount prior to arrival. Almog Eilat Backpacker's Inn accepts these cards and reserves the right to temporarily hold an amount prior to arrival. 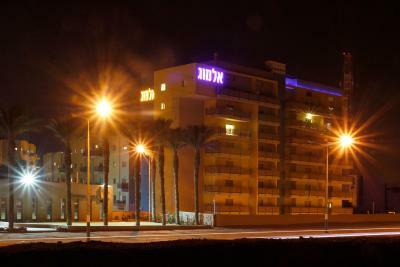 Please inform Almog Eilat Backpacker's Inn of your expected arrival time in advance. You can use the Special Requests box when booking, or contact the property directly using the contact details in your confirmation. The guy at the reception didn't seem to be used with travellers that stay at hostels. He was a little rude and I think the main business of the place is hotel and private rooms. I was by mylself in the room. By my arrival, the hostel's private reception was closed so I had to go to the Condo's main reception. The man in the desk was VERY rude and really didn't care about you. There was no towel in the apartment when I arrived and it took me some time to get one. Location is not good since it's far away from the beach and other facilities. It's not a hostel room but a very complete modern apartment in a condo, so you'll have plenty space and a fully equiped kitchen and bathroom. The bed is very confortable. The person in the hostel's private reception was very nice and gave me some tips about crossing the border to Jordan. the location is not really good, you need to run almost 2 km from the bus station, not even to mention the neighbourhood... the hostel announces itself as having a fitness centre and laundry room in the house, but you need to cross the street and go to another building to find those. Also finding the reception for the check-in was difficult especially that nobody could tell us where we should actually go. There are several buildings of this apartments group and you need to know exactly which door to open. Any attempt to ask at the counter in the other houses failed as they didnt even want to talk to us. Moreover, once we asked for new bed sheets, as ours got stolen from somebody else, they said we wont get anything else since they dont have time for this (reception). Overall, I would recommend staying somewhere else for this price..
kitchen in the room was well equipped. DO NOT STAY HERE I Hated Everything about this place. Staff is Nasty Nasty Nasty and rude the Owner ORNA was a Nasty B____ She stole from me then threaten to call the photo if I wouldn’t leave her office. They have Bed Buggs and your body will be full of flea bits See my photos. Your Stuff will get stolen and they pretend they don’t know what happen to it. When thee are Camera everywhere. The staff Steals So when your out they will go they your stuff, then Lie about it and say they have no idea what happen to it. If you go to the police they will laugh at you so do yourself the favor stay somewhere else. I’m a travel writer I would not write something bad if the place was Good! However this was a Nightmare. DO NOT STAY HERE I am a American Professional Solo traveler, writer, blogger, & Budget Queen. I’ve stayed in Thousands of hotel & hostels around the world I’ve traveled to 85 Countries, worldwide. This is one of the worst places I’ve stayed in the World. The whole world. I hated this place!! The Staff are nasty as Hell, very, very Nasty The guy that checked me in Refused to give me him Name but he’s works the night 3-11 at night. THIS not a Hotel or Hostel with other guest. Its a New York City low income apartment buildings. a Hugh apartment community for Hotel staff. Almog rent out 2 floors for Dorms, they have no business running hostel with no customer services skills. Not OK they should disclose this and I Would have never come here. It’s a apartment Community with 6 other buildings. Ms. Onar the Owner. Is a Nasty Nasty ——- Onar threaten to call the police after she Stole my Camera Strap. And refused to return it. All on camera but they refused to pull the camera for me to see who stole it. I asked her what would you call the police on me for? Lol you stole my Camera Strap from my go pro Head Camera now you want to call the police on me? That’s customers service. She & her Nasty Staff were rude from the first min I got there. I waited 24 mins in the hot sun for them to Let me check in. Waiting for a man to come to the apartment lobby to pick me up. I’m just sitting outside because I had luggage. And I didn’t want anyone to move them. When The Man did come. He was Nasty & Rude as hell. I said you know what I’m not going to stay and picked up my bags to leave but I had so much stuff and the taxis are expensive so I stayed one night. Never again. When you get there you walk another 10 mins pass 4 apartment buildings to the 7th floor. Of a building called lavender This place is a apartment community for the hotel staff employees. with people living there from hotel staff They rented out two floors and turned them into Dorms. That they charge me twice once from PayPal and another time when i arrived with my credit card. Very sad - very bad!! The large room - a large kitchen and a large showroom with extra toilet. Although Eilat is very small, the hostel is relatively far from the center, still, it's only 12-15 minutes walking distance. Friendly staff, comfortable beds, modern and relatively big room, modern bathroom and facilities for cooking. I read the reviews that it's very hard to find and was mentally ready for that. But it was even harder=) But that's the only downside of it. 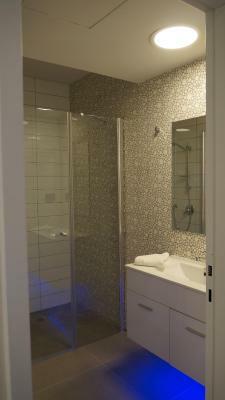 The beds, showers are very nice, modern, clean. 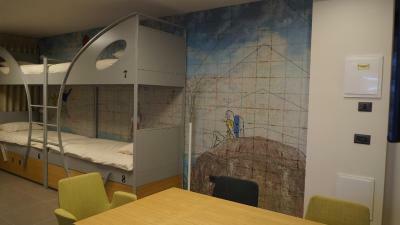 It is not a typical hostel with a lounge to meet other people. There is only 1 (or 2?) dormitory rooms besides the private rooms. 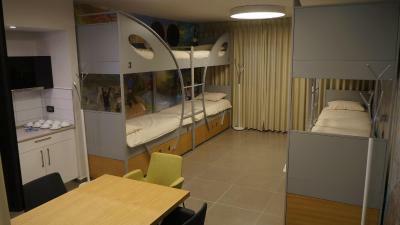 Very modern, nice dormitory with lockers, 2 toilets, own kitchen, tv, etc. Socket and light available by every bed.